A large enterprise client recently asked us to confirm whether its belief that the majority of organizations have moved to output- and outcome-based contracting models for testing services was true. What’s the Reality vs. this Perception? Our analysis of deals in our extensive database over the last 18 months showed that more than 75 percent of buyers are still contracting for testing services on a fixed price basis. Of those, nearly 50 percent are managed services contracts, where performance is linked to key performance indicators (KPIs.) The other 50 percent are a combination of fixed price and Time and Materials (T&M) contracts. In these types of arrangements, the part of the contract where the scope is clear and well defined is fixed price, and the T&M is for the part of the contract where the requirements are unclear, like testing support during the UAT phase, for change requests, etc. About 10-15 percent of the contracts in our set of deals from the last 18 months are purely T&M contracts where clients ask for specific testing resources. Only the final remaining 10-15 percent of the contracts are based on output- and outcome- based models. While the current percentage of output- and outcome-based models is small – the model is well-suited for engagements where the majority of work is transactional in nature, the client wants pricing clarity and guarantees, and the service provider has no explicit motivation to improve performance beyond service levels. In fact, we believe that the transition to these as-a-service models is both critical and inevitable for enterprises with engagements matching these criteria – which exceed 15 percent of our database. Why? Since the pricing is delinked from the underlying number of FTEs, process Improvements are driven by the service provider’s motivation to reduce internal costs and improve margins. In multi-vendor environments where there are more dependencies, moving to output- or outcome-based models may increase costs as providers bake the higher risk into their fees. In our view, most enterprises going down the output- and outcome-based model path will be best served by phasing in the adoption. Doing so will not only help them reduce risks, but also enable them to appropriately update their systems to process output-based transactions, create and put in place sufficient governance mechanisms for the new contracting regime, etc. Have you embraced an outcome- or output-based contracting model for your testing services? Are you considering it? Please share your experiences with us at [email protected]. We recently conducted a deep analysis of the digital maturity of almost 60 shared services centers, (also referred to as GICs) across diverse industries and geographies, and disseminated summary findings through a series of round tables across different Indian cities, including Delhi NCR, Bangalore, Mumbai, and Pune. You can read the detailed results in our recently released Digital Maturity in GICs | Pinnacle Model™ Analysis. Here, I want to focus on a question that recurs in most of our conversations: Does the size of a GIC have any implication on its Pinnacle performance on digital maturity? Note that we define Pinnacle GICs™ as those that achieve superior performance because of their advanced capabilities. The answer to this question is not as objective as it seems. Our study revealed that scaled GICs (those with 3,000+ FTEs) have consistently delivered better impact across cost savings, operational KPIs, and even strategic metrics such as contribution to revenue growth. It also showed that small (those with less than 1,000 FTEs) and mid-sized GICs (those with 1,000 – 3,000 FTEs) have demonstrated lower improvement across all business outcomes. Based on our analysis, less than one-third of scaled GICs have been able to demonstrate Pinnacle performance, while multiple small and mid-sized Pinnacle GICs (~30 percent of the Pinnacle performers) have achieved superior outcomes because of their advanced capabilities. A U.S. food & beverages major’s GIC (also mid-sized, with 1,500-2,000 FTEs) is leveraging pricing analytics to drive competitive advantage for its parent. The GIC developed a competitive intelligence and analytics platform, which allowed the firm to view what its competitors are selling and make recommendations on the necessary price changes to its merchants. This platform is tied to a machine learning engine that dynamically prices their products. We believe it is the triumvirate of the approach to demand creation, strategic focus of the digital strategy, and orientation towards cross-functional collaboration. A pull-based approach to demand creation – i.e., a proactive approach to creating Proof of Concepts (POCs) and showcasing capabilities – has not only helped shared services centers secure CXO-level sponsorship, but also increase the existing breadth and depth of services to enable end-to-end process orchestration. For instance, a European BFSI major’s GIC currently operates as the RPA CoE, and champions the end-to-end global RPA program for the enterprise. However, this was not the initial mandate for this shared services center. It proactively started developing POCs, capitalized on visits by onshore C-level executives to showcase their capabilities, and subsequently received buy-in from the parent company. The CoE now operates in a hub and spoke model, wherein the India GIC (hub) provides global governance and drives RPA for Europe through the CEE shared services center (spoke). While other GICs solely focus on technology adoption, most Pinnacle GICs focus on using technology to enable operational improvement, which consequentially results in employee and/or customer experience enhancement. With achievement of these objectives, financial benefits – both top-line and bottom-line growth – follow suit automatically. Technology adoption per se needs to be viewed as a means to the end, not the end itself. Pinnacle GICs’ more holistic approach allows them to see both higher chances of success and ROI. All these aspects, along with dedicated enterprise leadership, have enabled Pinnacle GICs to champion organization-wide digital services delivery. If you’d like insights on how your shared services center stacks up against the competition on the digital maturity front, please feel free to reach out to me at [email protected]. Insurers are increasingly investing in AI to enhance the customer experience with automated personalized services, faster claims handling, and individual risk-based underwriting processes by empowering agents, brokers, and employees. Our recently released Insurance IT Services Annual Report 2018 found that more than half of insurers are opting to build in-house AI capabilities through hiring, internal training, hackathons, acquisitions, and partnerships with InsurTech companies, while the rest are turning to IT service providers. The appetite for change within the insurance industry is certainly there. To make that change happen quickly, insurers have been investing in InsurTechs, firms offering technology innovations designed to squeeze out savings and efficiency from the current insurance industry model, to align data and integrate backend systems. 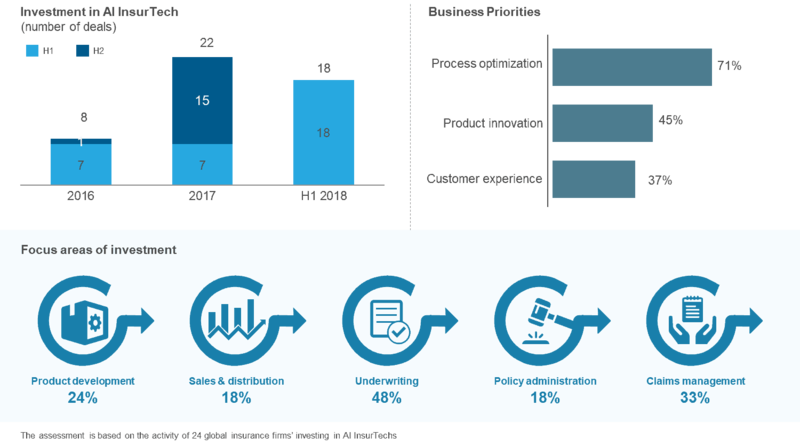 Total InsurTech funding reached US$2.3 billion in 2017, a 36 percent increase from the US$1.7 billion recorded in 2016. In 2016, AI and IoT accounted for almost half of the total investment in InsurTech startups globally. AI InsurTech investment has increased multi-fold since 2016. Seeking access to talent pools, innovative ideas, high speed, and lower cost of innovation, leading insurers have invested in startups including Betterview, Captricity, CognitiveScale, Lemonade, Mnubo, and Uniphore. And 2018 appears to be spurring even more investments. Indeed, some of the top insurers have created dedicated venture capital arms – e.g., Allianz Corporate Ventures, MetLife Digital Venture, and XL Innovate – to invest in technologies such as voice biometrics, cognitive virtual assistants, speech analytics, telematics, drone imagery, and machine learning. Research we conducted on 24 leading insurance firms’ investment model suggested that more than 70 percent of their investments in AI InsurTechs are not just from a funding perspective. Rather, they are entering into partnerships with the InsurTechs as a more strategic decision to fulfill their long-term vision of digitalization. Customer experience: AI is making traditional claims processing a thing of the past. Companies are pioneering new cognitive solutions that are making the claims process faster, smarter, and more efficient. For instance, in 2018, GENERALI implemented Expert System’s Cogito® technology to focus on registration and claims processing, and to automate the customer email classification, resulting in a swift and smooth claims process and better customer service. We believe these partnerships create a win-win situation. They give insurers access to the necessary talent pool, latest technology, innovation, and speed they need to thrive, not just survive. And they provide vital to insurers’ ability to compete, and provide InsurTechs with the guidance, infrastructure, funding, and customer base they need to grow. If you’d like insights on leading InsurTechs and how they’re changing the insurance industry, please feel free to reach out to [email protected] and [email protected]. Third-party service providers are redefining how they compete in the new digital world. The pressure to gain market-leading positions intensifies as the new digital business model threatens to shift market share and upend existing market leaders. At the heart of this new business model is a shift away from labor arbitrage and its FTE pricing to a software-defined model and consumption-based pricing., It’s a new world, and I believe it’s important for companies seeking to buy services to be aware of how of service firms are investing to position themselves for the digital market. There’s no shortage of market discussion around a wide range of customer experience (CX) opportunities and challenges. It’s what everyone in your organization, from IT, to HR, to actual customer care, are talking about. But while ideas about what you should be trying to achieve and why you should care abound, insight on how to actually execute and what delivery outcomes to target is hard to come by. One approach drawing attention involves the use of contact center outsourcing (CCO) services. The traditional “butts-in-seats” model is evolving to more of a customer experience management (CXM) service model, where outcomes are assessed for impact as much as for cost management. The traditional view has been that the primary value delivered by CCO providers is operational cost savings through efficiencies, labor arbitrage, and scale. But that’s no longer enough. An increasing number of enterprises are raising the bar and looking to their CCO providers for an expanded value proposition targeting digitally-enabled and differentiated CX capabilities. We refer to this engagement approach as Customer Experience Management (CXM) services. We believe that companies really serious about reshaping their brand through memorable CX are more often turning to this new model of CXM services. We call this breed of buyers CX Outsourcing Pinnacle EnterprisesTM. And we believe these enterprises are very intentionally leveraging these advanced CXM services to enhance their corporate-wide CX strategies, and to achieve results more quickly and at lower costs. We’ve launched a unique study to dig deep and identify how these Pinnacle Enterprises engage CXM services to drive both operational and strategic imperatives for their overall CX strategy. How can this emerging model help enterprises tackle high-value CX objectives such as digital enablement, greater insights on and visibility into consumer wants and behaviors, increased wallet share, and reduced customer effort? What are the mechanisms in play around technology, governance, talent models, pricing models, and others? This is an all-around different approach to CXM services – a rethinking of which outcomes to target, what to measure, the role of technology, and the new relationship model. Curious to know what leading CX Outsourcing Pinnacle Enterprises are doing? Want to know where your organization stands compared to others? Everest Group invites you to become part of the research process and take our survey. Enterprises are increasingly looking to analytics to achieve top line impacts – think marketing and pricing analytics to support new product launches and better understand consumer behavior – and positive contributions to their bottom line through, for example, risk and fraud analytics. And they’re increasingly favoring GICs over third-party providers to support their analytics initiatives. Why? By the nature of their engagement model, GICs are tightly integrated with the parent organization, which better enables the high levels of governance and management that are essential to deliver analytics services. GICs also have an edge as they can bundle analytics services into the business process services they deliver to provide integrated solutions. Here are just a handful of examples of the types of value GICs are delivering to their parent companies. A leading retail company’s India GIC leverages analytics to study the shopping patterns of customers in 20+ countries to predict how the market will grow or decline, understand customer loyalty patterns, etc. The Poland GIC of a leading U.S.-based consumer goods company implemented prescriptive analytics algorithms on its AdWords account to eliminate inefficient spend on paid searches, in turn saving substantial amounts of money. Of course, the quality of the analytics and the impact of the resulting outcomes are directly related to the analytics talent the GIC employs. Some GICs have chosen to upskill and reskill their existing workforce. While one has made it mandatory for select teams to undergo analytics courses and training, others have provided monetary incentives to team members who willingly opt into the training. Both approaches make GICs talent-ready to deliver analytics capabilities and face demand fluctuations. GICs are also exploring partnerships with specialist firms that can provide resources for a short duration, as needed. To deliver even greater value, many GICs are proactively identifying areas within their operations to plug-in the analytics layer. To facilitate this, they have established analytics as a shared horizontal capability in their organization structure so that the skills and knowledge attained from one team can be leveraged by others. Further, GICs are heavily investing in training data scientists, and providing them global exposure to understand business needs better. The days of providing just arbitrage are long gone. If your GIC wants to deliver the value your parent company needs in today’s business environment, analytics capabilities must enter into your equation. To learn more about our view on GICs’ analytics capabilities, be sure to attend our sessions at the NASSCOM GIC Conclave (note, Everest Group is the Strategy Partner for the event) and visit us at Stall 7. Increasingly, there has been a push by firms purchasing services to move towards consumption-based pricing. Accompanying this move is an additional desire to reduce the length of contracts. Ideally, you should only pay for what you use; and when you stop using it, you stop paying for it. Although this is what traditional contracts purport to offer, the reality is far from this seemingly natural and beneficial state. Most traditional contracts create buyer lock-in and require some form of take or pay. But it might just be the tipping point for stakeholders – including regulatory bodies, payers, physicians, advocacy groups, and patients – to start having constructive discussions with drug manufacturers on how to make drugs that treat extremely rare diseases more accessible to the very small share of the population that needs them. It is certainly time for pharma companies to overhaul their operations in order to mitigate price anger and get such drugs into the hands of those whose lives depend on them. One way they can do so is by employing pay-for-performance, or outcome-based, contracts, wherein the manufacturer charges for the drug once it proves effective, say one or two months into treatment. Note that this pricing model hasn’t yet really taken off, especially in the United States, where the fragmented multi-payer environment acts as an added roadblock. Indication-based pricing, wherein there are different prices for different conditions, is another model that biopharma companies can use, but the U.S. market does not have mechanisms in place for it, at least as of now. Other ways of ensuring patients are able to benefit from such critical drugs are through mixes of personalized offline and online marketing campaigns directed specifically to the relevant patient and physician pool, and improved and comprehensive patient support programs to help in solving “last mile connectivity” issues. But at the end of the day, stakeholder backlash might – and should – force pharma companies to drive down their own costs to make these expensive, personalized medicines more affordable. And this is where outsourcing service providers can help. The third-party service providers that are already servicing the pharma industry need to prepare or bolster solutions and capabilities around areas including patient and market access, data analytics, omnichannel marketing, IoT, automation, portals, applications, customer support, pricing analytics, infrastructure modernization, and cloud orchestration. Service providers that are struggling to enter the life sciences space should view this as a window of opportunity to get a foot in the door of these companies. Doing so will mean additional business for both these types of vendors; it could also mean reduced pricing pressure for the patients who need such vital treatments. The future of personalized medicine depends a lot on success of such drugs, and biopharma companies can no longer afford to sit back and operate like they always have. For a detailed discussion and analysis around these solutions, and to learn about other trends in the life sciences market, look out for our soon-to-be-published State of the Market Report.